The Astro+ is the perfect device for your everyday needs. Plays YouTube videos, games or music. Surf the Internet, read e-books or log in to your favourite social networks. 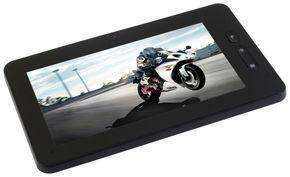 The Sumvision Cyclone Astro+ is a fully functional tablet that also provides the flexibility that the Android 4.0.3 operating system is known for. The Astro+ is provided with a fully functional capacitive touch screen allowing actions such as zooming in/out and auto screen rotation. 3D Acceleration: With support for 3D acceleration, be amazed by the smooth game play and graphical capabilities of the Astro+. Play all the latest Android games with stunning 3D graphics. Supports flash Player 10.3. View web pages with flash graphics smoothly. Will it support video calling via skype? Yeh comparing a £80 tablet to a £300 - £400 one. Also let me point you to the Samsung Galaxy 10.1 for you know superior users, unlike Apple peasants. Yeh comparing a £80 tablet to a £300 - £400 one.Also let me point you to t … Yeh comparing a £80 tablet to a £300 - £400 one.Also let me point you to the Samsung Galaxy 10.1 for you know superior users, unlike Apple peasants. Where did you "bring" it to? Why do kids use brought instead of bought? They two completely different words and meanings. What's the battery life like on these? It says 5-7 hours playtime. I literally want a tablet that's capacitive so that I can install one app (Ultimate guitar) but every time I see one on here I freak out cause I want something that'll be worth the cash, I will of course use it for other stuff but I'm just looking for the best bang for my buck. Reckon this is the best you'll get for £80? at just under £55? only difference is 512mb instead of 1024mb, and 8gb instead of 16gb storage. Those shouldn't make any diff to that app. Oh, and lack of output to HDMI if you were planning to output it to your TV? Much the same as this apart from the lack of HDMI and half the RAM. And from what someone posted above, doesn't sound like you get better support just because it's from ebuyer! Ordered one for my dad last night when there were 450 left. 50 now. Looks a cracking tab for the money. Not quite as good resolution battery or speed as my playbook or the new nexus, but for 80 quid is a bargain. Battery on the playbook is about 7-10 hours with a 5300mah batt. This being 3500 and driving a lower res screen with a less power hungry processor should last 5-7 hours. If you only want it for that one app, Midnight Tboy is probably right. Go … If you only want it for that one app, Midnight Tboy is probably right. Go for the cheapo Chinese import and save yourself £30. (As long as you don't want/need the HDMI output .... as he mentioned)Much the same as this apart from the lack of HDMI and half the RAM.And from what someone posted above, doesn't sound like you get better support just because it's from ebuyer! I'd love the HDMI so that I could blast the tabs up onto the TV when I'm home. I currently do it with my laptop but the convenience of the tablet (size) and the fact that the app saves tabs for offline view would be amazing. So is £80 the best price I'd get? As it stands right now yep. There was a more or less identical model to this, but with 8gb storage instead of 16gb (and still having HDMI output etc)...which was only £69.99 but thats expired in the last few days. futeko.com/pro…php would be the other only similar option - still has HDMI output - but at same time ram is back down to 512mb from 1gb, and memory only 4gb........which after partition etc info is sorted doesnt give much to play with. I've got one of these and it's great for apps but practicaly unusable as a browser. You get the message "browser not responding" almost non-stop. Where did you "bring" it to? Why do kids use brought instead of bought? … Where did you "bring" it to? Why do kids use brought instead of bought? They two completely different words and meanings. Thank you for your waste of space post! Yes it was a spelling mistake. I've got one of these and it's great for apps but practicaly unusable as … I've got one of these and it's great for apps but practicaly unusable as a browser. You get the message "browser not responding" almost non-stop. Try Dolphin or Opera Mini browsers. The stock ICS browser has a habit of clogging up on these cheapo tablets. I found Dolphin HD was a lot more usable on my one. Opera Mini should be even more so as it caches the webpages before sending them to the device in order to speed things up. bryfly, you have this listed as "Memory •1GB DDR3 RAM•8GB Flash" but it is actually "16GB Flash"
does anyone know if you can connect an external hard drive to it? Voted hot due to the picture of the gorgeous Yamaha R1 on the tablet's screen. Yes, Skype video works well, even though camera is 0.3 M. Still, best to use with good light. I'd love the HDMI so that I could blast the tabs up onto the TV when I'm … I'd love the HDMI so that I could blast the tabs up onto the TV when I'm home. I currently do it with my laptop but the convenience of the tablet (size) and the fact that the app saves tabs for offline view would be amazing. So is £80 the best price I'd get? Note the connector on device is mini HDMI, so adapter/cable needed. Yes, can connect external hard drive, but better it is separately powered, or tablet is powered from it's mains adapter at the time. When you look in to it the same Chinese supplier to Sumvision also supplies about 6 different companies and hence the different names. Sumvision tailor Apps to what they think you need and some of rest do similar. Try Dolphin or Opera Mini browsers.The stock ICS browser has a habit of … Try Dolphin or Opera Mini browsers.The stock ICS browser has a habit of clogging up on these cheapo tablets. I found Dolphin HD was a lot more usable on my one. Opera Mini should be even more so as it caches the webpages before sending them to the device in order to speed things up. I have no problem with their previous product. Why do you say this? I tried to get a monitor repaired/replaced just before the 3 year guarantee ran out. I've seen bankers with more honesty!